Unity Council Volunteer Tom Matarrese keeps Roberto Costa company as he works on mosaic artwork along east 14th St.
On a cloudless but cold Saturday morning, two volunteers wearing fluorescent vests kneel in front of trash receptacles on the sidewalk along East 14th Street in Oakland’s Fruitvale district. Roberto Costa is attaching tile borders for mosaic artwork that will later be created over the foundation that he prepared the previous weekend. Mona Lisa Norr is filling in the mosaic artwork on another side of the same receptacle. People walking by stop and admire the artistic process and thank the volunteers for beautifying their neighborhood. “This is one way to break the ice,” says Costa about the community-building mosaic art program that he helped create. 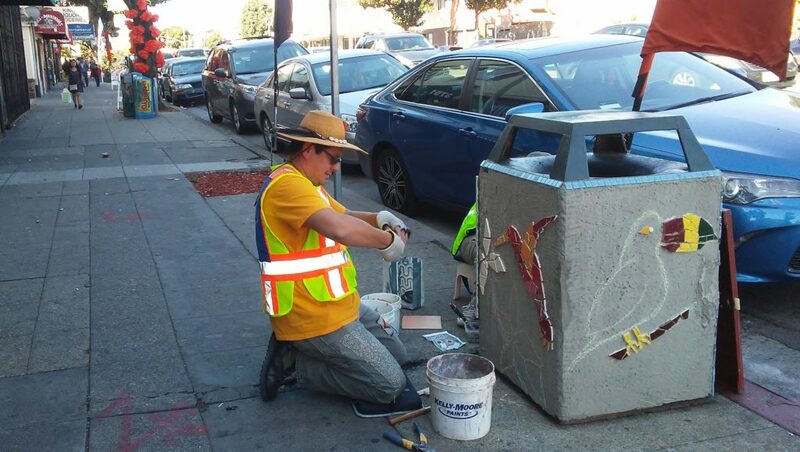 Roberto Costa and Mona Lisa Norr (her green vest is just visible) work on a trash receptacle on east 14th St.
Costa, who works in the City of Oakland’s Rent Adjustment Program, became inspired on a 2008 trip to Arcata, where trash receptacles in the central square were covered with mosaic tiles. When he returned to Oakland, he got involved with mosaic art projects in his Allendale neighborhood and in nearby Maxwell Park. Their main goals were to build community, beautify the neighborhood, recycle materials that otherwise would have ended up in a landfill, and call attention to where residents should be putting their trash. Eight years later, Costa still volunteers for mosaic projects throughout the city, mostly preparing the foundation upon which a growing number of other volunteers create their artwork. Now a part of the City’s award-winning Adopt a Spot program, groups or individuals can sponsor artwork on a trash receptacle by agreeing to pay for the materials and committing to maintain the art once it’s created. Spraypaint vandalism occurs occasionally, but can be cleaned off of the tiles. Only once in Costa’s memory has a project he worked on been damaged. The sponsoring organization talked with the family of the young vandal, and there have been no problems since. Costa had limited knowledge of mosaics when he visited Arcata in 2008, but took classes upon his return. He has also learned while collaborating with more experienced artists, including Juan Lopez, whom he worked with in Adams Point. Lopez has since decorated the trash receptacles in his Temescal neighborhood. Costa has created a handbook to teach people how to do these projects, and encourages others to join in. “It became like a domino effect,” he says of the proliferation of mosaic art projects throughout the city over the past eight years. The themes and quality of the artwork vary by neighborhood, but Costa focuses on the positive intentions behind every project. The following day, on the other side of town, I visit Lizz Millota in her home studio. A techie by day, Millota is also a multi-media artist who has been involved in cleanup and beautification projects in her neighborhood throughout the past two decades. 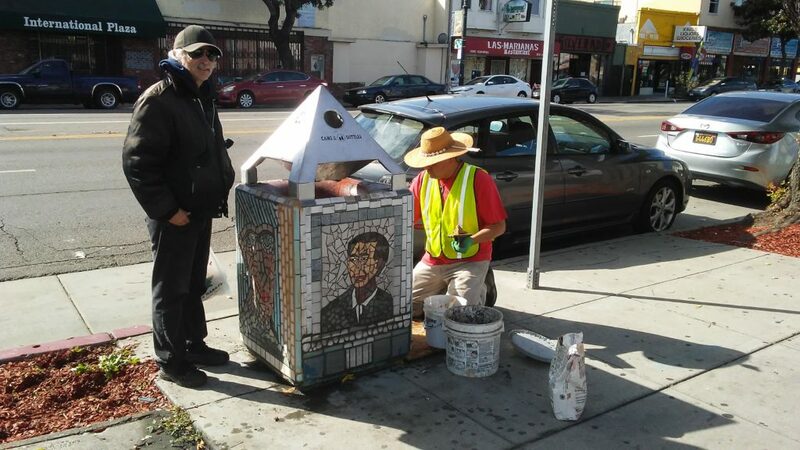 After touring Lopez’ mosaics in Temescal, she was inspired to adopt a trash receptacle in her own neighborhood. She came up with the idea for a historical tribute to the once-futuristic googie style of architecture formerly embodied by Biff’s Coffee Shop, which she enjoyed visiting years ago. “It’s been an obsession of mine for a long time,” she says about the iconic spaceship-shaped building that sat vacant at Broadway and 27th Street for 20 years before being demolished in 2016. Millota started an online campaign to raise funds for the project, which will also pay homage to ¼ lb. Giant Burger and Dave’s Coffee Shop as well. She plans to use glass tiles that she will custom cut with a water jet machine, and will even use miniature tiles to create a QR code that will bring people to a webpage with historical info about the restaurants. Her biggest fear was that the project would get damaged before it was completed, so she will be creating the artwork on a mesh backing that will be mounted onto the receptacle once the artwork has set. “This is all an experiment,” says Millota, who hopes to adopt more spots in the future. Roberto Costa and Mona Lisa Norr cross east 14th St. to take a lunch break. 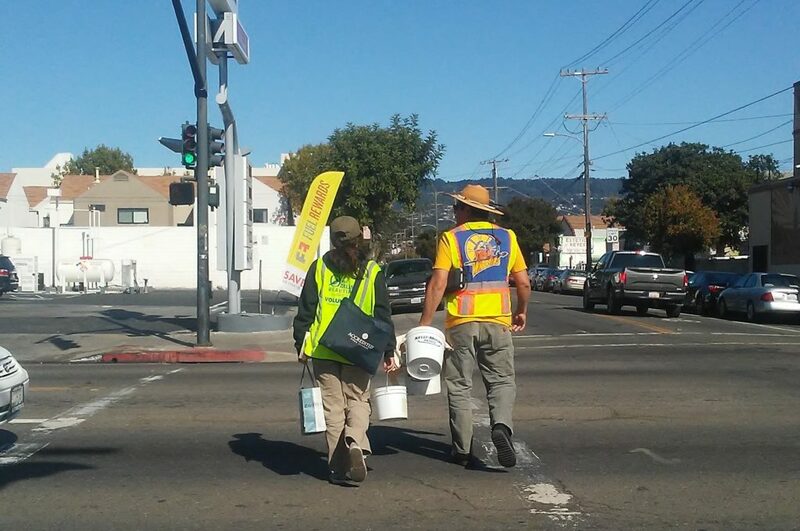 A week later, Tom Matarrese, who has lived in Fruitvale for 57 years, accompanies Costa as he finishes decorating another trash receptacle along East 14th. Matarrese, a volunteer with the Unity Council, serves as a photographer, archivist, logistics guy, and project foreman for public art projects that they sponsor. Costa facetiously adds “bodyguard” to that resume. Matarrese says that vandalism hasn’t been a big issue for the projects sponsored by the Unity Council. “It’s artwork. It’s hand done,” he theorizes. “People show more respect for something that people have put a lot of labor into,” adds Costa. When asked about creating the artwork in a studio instead of out on the streets, Costa simply shrugs. As he laughs heartily at his own joke, a large group of youth on scraper bikes ride by on East 14th. Tony Daquipa is a musician who has been studying and playing a variety of percussion instruments since 1986. In the 1990s, he was also a journalist, historian, and community activist. After that, he worked in non-profit public health for 13 years, during which time he also returned to school to study public policy. He is in his third year of working in the public sector. In addition to public service and music, Tony is a proud parent, public school advocate, published poet, photographer, hop farmer, collector of East Oakland rainwater, urban bicyclist, karaoke diva, grumpy old man, storyteller, and preserver of history.